Boy band One Direction have once again taken the charts by storm, this time with their Comic Relief charity single – ‘One Way or Another (Teenage Kicks)’. The single, a cover of both Blondie’s 1979 hit and The Undertones’ ‘Teenage Kicks’, has already become the fastest-selling single of 2013. In fact, the song has proven to be such a success that it has even fended off competition from the likes of Bauuer’s ‘Harlem Shake’ and Macklemore’s ‘Thrift Shop’ to make it to the top of the charts – two viral hits whose success is comparable to that of Psy’s ‘Gangnam Style’. The boys treated fans to their first performance of the song whilst attending Friday’s Brit Awards. As the heartthrob five took to the stage, the O2 stadium was filled with what were arguably the loudest screams of the night by the boys’ many fans. As well as achieving great success in the charts, the video for the single has also proven a big hit – already clocking up millions of online views. 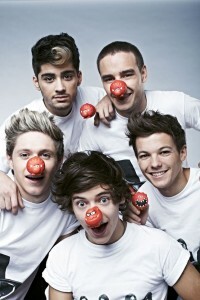 The boys shot the humorous music video themselves; clips include band member Niall taking a shower, the boys spending time in Ghana and even dancing around the Prime Minister. In aid of the charity single all five boys visited Ghana in Africa, to see for themselves how money raised by the charity will help to save families in desperate need of food, water and shelter. You can find out more about the boys’ trip during the live Red Nose Day telethon, which will be broadcasted Friday 15th March. This entry was posted on Saturday, February 23rd, 2013 at 4:32 pm	and is filed under Music News. You can follow any responses to this entry through the RSS 2.0 feed. Both comments and pings are currently closed.